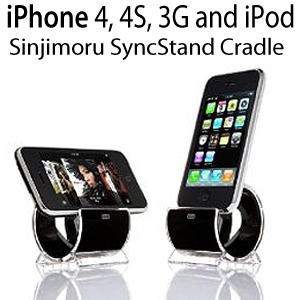 Black Sinjimoru SyncStand Dock Cradle, holder iPhone 4, 4S, 3G, 3GS, and iPod. Beautifully crafted and supremely usable, the black sinjimoru stand for iphone and ipod is the epitome of chic. Compatible with most iphones and ipods including the iPod Nano (not 6th gen) iPod Classic, iPod Touch 2G, 3G and 4G, iPhone 3G, 3GS or iphone 4. The beauty of this stand is that the designer has allowed for the original apple cable (not included) to be used with the holder for best compatibility. The cradle can also be used horizontally or vertically acting as a viewing stand. Additionally the sinjimoru black cradle can be used with the iphone in a bumper or skin A Designer Piece on Your Desk It makes iPhones and iPods look better. Inspired by the icon of worm-eaten apple, Sinjimoru's sync-stand matches any Apple product. The transparent texture, which is the base of Apple design, compliments the clear white colour. Natural Vertical / Horizontal Cradling Sinjimoru sync-stand naturally supports landscape and portrait(with charge and sync) mode. Use of Genuine iPod Cables Unlike other stands that have no charging function, the sync-stand plays the role of a cradle that is capable of charging and syncing with a genuine Apple iPod cable is installed. *An after market iPod cable also be used if the size is same. Cable Attachment & Detachment Made Easy The cable attached to the sync-stand can easily be detached any time. 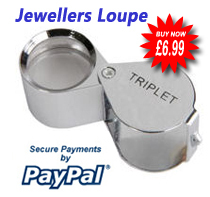 It can be separated from the sync-stand within a few seconds if needed. Excellent iPhone, iPod Compatibility This stand supports all the latest iPod products after 5th generation such as iPod Nano,(not 6th gen), iPod Classic, iPod Touch, iPhone 3G, 3GS or 4G. Using It With the Protection Case? Not a Problem.It allows the user of the cradle for charging or syncing the device in a vertical or horizontal position even when the case is on the gadget. Ingenious, stylish and inexpensive cradle type stand for iPods and iPhones. Works well with genuine iPod connector cables but not with some non genuine cables. I purchased this stand with the 'USB Dock Connector Cable For Apple iPhone 4 - Black by Jazooli' as indicated by Amazon as a 'Frequently Bought Together' suggestion but the cable doesn't fit the cradle, the plastic part of the iPod plug is too big for the slot in the stand.